Trading posts can be found in a majority of banks throughout the game. They allow you to advertise items that you wish to sell across all worlds to other players. You can then arrange a trade with someone that wishes to buy your items, or someone that you wish to buy items from, and access items that you are selling in the trading post from within the trade screen. Getting to grips with using the trading post is very easy. The video below runs through the features of the trading post so you can make the most of it from the second you log in. Back in poll 20, we offered this bare-bones trading post with several optional features. In particular, we offered to let you trade directly through the trading post without having to meet up, and we offered to let your offers remain on the post while you're offline. Neither of these options passed, so we've delivered the trading post without them. Now it's here, we'll presently be polling additional features as expansions to it. We'd be happy to offer big changes, such as expanding it into a fully-featured Grand Exchange like RS3 has, if it looks like there's enough support for that. 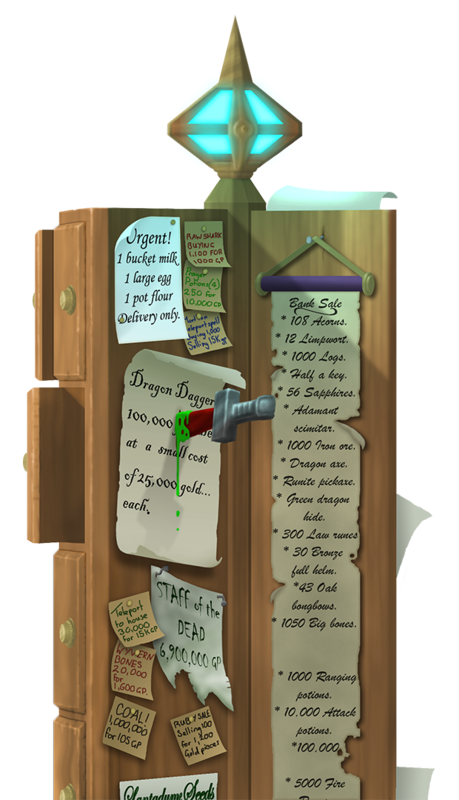 Alternatively we could offer more conservative changes, such as letting players send Trade requests through the post so you could use the old-school trade screens without having to meet up. We're sure you've got design ideas of your own too, and we'd love to hear them. Trading post expansions will be polled in the New Year; due to the scale of work involved in any trading system, we wouldn't have been able to release any major changes before the Christmas holiday. Apart from bigger design changes, we're expecting to expand the range of item sets that the trading post can package up. • November has passed and the Well of Goodwill has now disappeared. • The unusual chickens filling the streets of Gielinor have now been removed. • A number of items have had their names appended to avoid clashes in the trading post. • The poll booths in Seers Village and in Ardougne south bank have been returned. Join Mod Ronan over on the RuneScape Twitch channel at 9pm GMT for a pest massacre at Pest Control. If you want to grab yourself some void then make your way to the Void Knight Outpost on world 349 at 9pm GMT and make sure to tune in! EDIT: When the "new" price emerges next year, will ironmen accounts pay less for p2p, as they are not allowed full access? Sigh, a grand exchange? HOW ORIGINAL . Really hope the trading post is getting an expansion! Alternatively we could offer more conservative changes, such as letting players send Trade requests through the post so you could use the old-school trade screens without having to meet up. Some players complain that it's too much like a Grand Exchange. Some players complain that we should have done the Grand Exchange instead.